Cedars of Lebanon State Park is a great place to birdwatch. With almost 1,000 acres in the park and another 8,000 in the state forest, the cedar glades and stands of hickory, oak and ash trees are home to dozens of species of birds including: songbirds, woodpeckers, owls, hawks and migratory birds. There are trails through the various habitats found in the park that offer many opportunities to see and hear many different birds. If you capture a good photograph of a bird, or anything else in the park for that matter, we would love to see it. And with your permission, place it here on our webpage and our Facebook page. 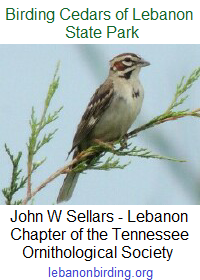 Click the image below to view a listing of the latest bird sightings in and around Cedars of Lebanon State Park. This Cedar Waxwing photo appears courtesy of Howard B. Eskin. Thank you, Howard!